Within a couple weeks of snowfields receding, the first western pasqueflowers of the year begin to blossom, closing up during the evening as cool mountain air descends. 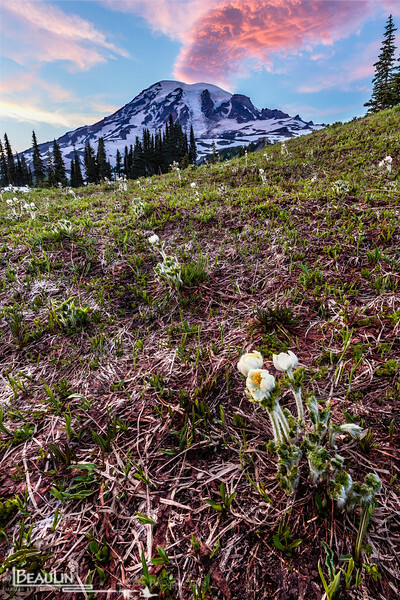 Taken from the alpine meadows of Mazama Ridge shortly after sundown in the Paradise area of Mount Rainier National Park in Washington State. This shot is comprised of 7 images manually blended using multiple exposures, focus stacking, and luminosity masking techniques. This shot is not an HDR tone-mapped image. Sometimes you need luck to catch a shot like this. Often clouds will form unexpectedly over Mount Rainier and cover the summit. While laying on the ground to take this shot, I was too engrossed to notice the clouds other than the pink color. It wasn't until downloading the images that I noticed the cloud looked like an ash column emanating from the volcano's cone.